This month’s theme was ‘Blade’. The November Loot Gaming was themed ‘Blade’ – it features items from Kingdom Hearts, God of War, Elder Scrolls, and Assassin’ Creed. You’ll get a large fold-out information sheet. One side features a 28×22 fold-out poster for your wall. Blade Pin – Value $5? This month’s pin focused on the theme and not a particular franchise. Exclusive God Of War T-Shirt – Value $15? Still, to this day, I’ll still be excited over anything God of War related – so I’m definitely loving this shirt. It’s officially licensed from PlayStation, too. Elder Scrolls Map Mousepad – Value $20+? This might be the first normal size (kind of) mouse pad we’ve received from Loot Gaming. In past Loot Crate deliveries (June 2015 Core Crate and March 2017 Loot Gaming) we received large gaming pads – but this is more along the size of a normal mousepad, but a bit more on the wide side. It features the map from Elder Scrolls – I wonder, is the map on your mousepad also useable to Elder Scrolls fans out there? Kingdom Hearts Keychain & Lanyard – Value $10-15? This is a bit of a 2-in-1 item. You can pop the ‘key’ keychain off and use it independently from the lanyard – or leave it on to complete the Kingdom Hearts look. This lanyard comes with a detachable clasp – so it’s easy to pop your credentials off if needed. 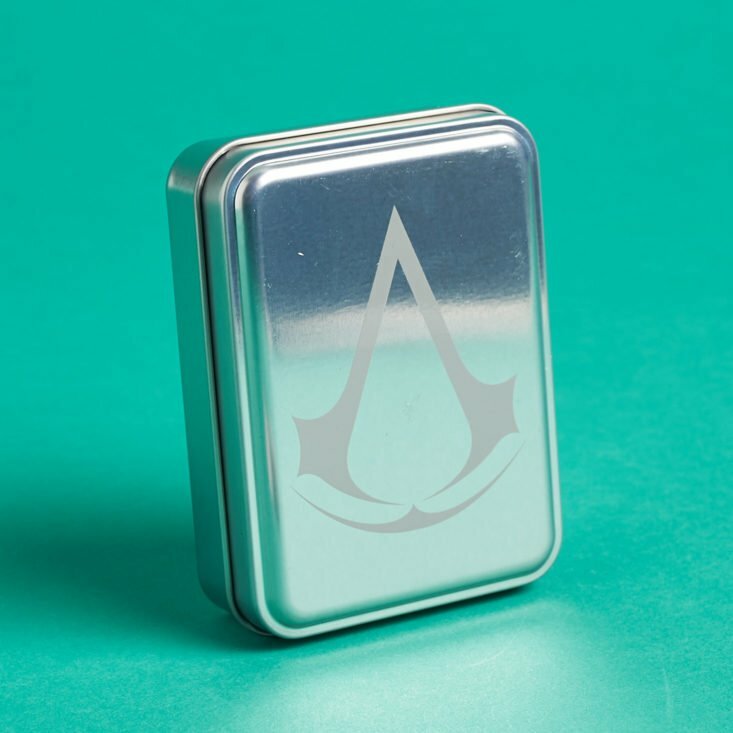 Assassin’s Creed Playing Card Tin – Value $10? The box finished with some exclusive Assassin’s Creed playing cards. The cards feature some artwork from the games – and also comes with a little tin. Verdict: Loot Crate is having a lot of shipping issues with their crates – they’ve just canceled their Star Trek crate, too – so you’re going to have to be alright with potential delays when subscribing to any lines right now. This box was late (it arrived mid/late December) and I’m also late in getting round to the review (sorry!). This wasn’t even close to a favorite for me – but I’m also only really into God of War from this month’s franchises – what did you think? Can you still get this box if you sign up today? No. You’ll have until the 27th of each month to get that month’s theme! What did you think of the November 2018 ‘Blade’ Loot Gaming?